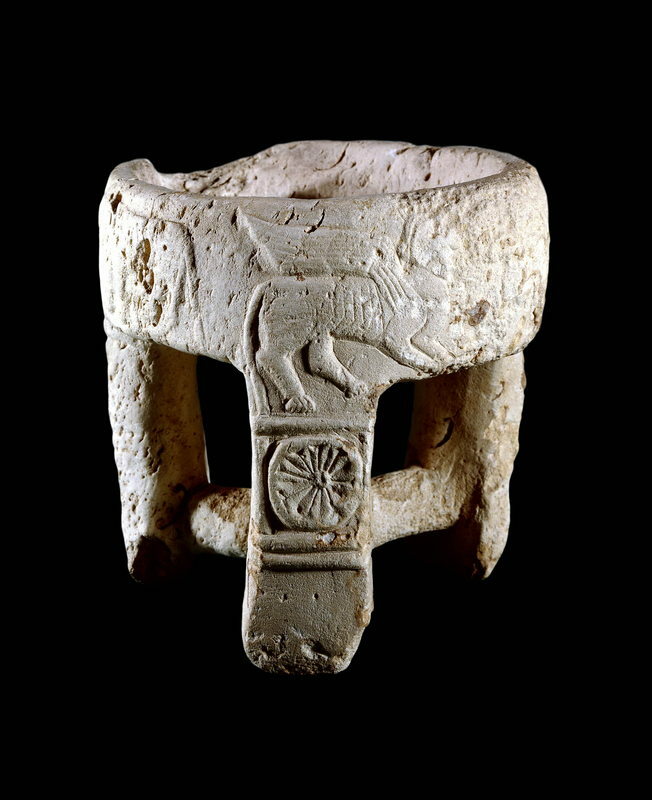 This elaborately carved tripod vessel may have served as an incense burner, as evidence of burning substance was found in the bowl. It comes from a royal tomb of the tenth or ninth century BCE at Tel Halaf (ancient Guzana). Tel Halaf was an important Aramean site that became a vassal of the Neo-Assyrian empire in the early ninth century and was assimilated fully into the Neo-Assyrian empire by the end of that century. The sides of the vessel are decorated with carvings of bulls, a winged quadruped, and a man shooting a bird with a bow and arrow. The legs of the tripod are decorated with incised rosettes. Another example of an incense burner may be found here. Limestone tripod bowl, probably used as an incense burner. Height: 12cm; Diameter: 11.8cm.